Spent one night over Labor Day Weekend. Followed entrance to general parking in front of casino. 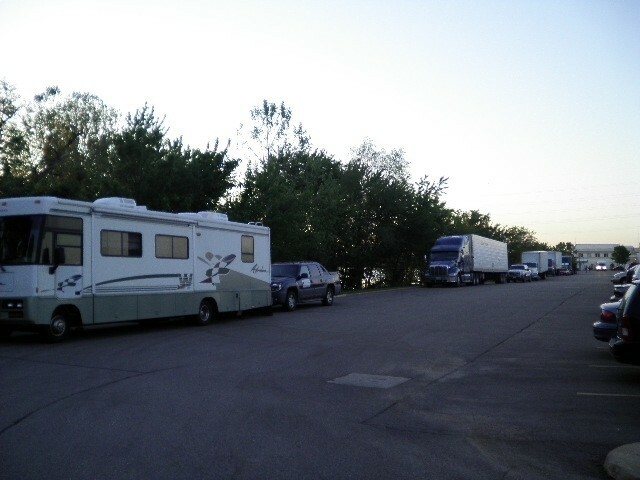 Far edge of parking lot along grass strip has limited spaces for buses, RV’s or Semi trucks. There was a sign along entrance road stating no overnight parking; but parking areas were patrolled regularly by security personnel on bicycles who never bothered us. Casino is well stocked with both older and new slot machine games as well as table games and a poker room. Had no problem finding seats at slots or tables despite being a holiday weekend. Buffet was $17 for supper meal. Small deli area, steakhouse, and bar area serving food also available. from reader Karen B, October 2006. To get to the RV parking follow the signs for general parking. At the west end of the parking lot there are long spaces marked for bus and RV parking only. There aren't very many spaces and since our motorhome is short enough to fit in two standard car spaces we parked on the edge of the regular lot which was fine. We didn't eat at the casino but played some on the two days we were there. It seemed to us to be better laid out and roomier than most other riverboat casinos in this area of the country. The entire casino closes from 6AM until 9AM. The restaurant area reopens an hour earlier at 8AM.